New from Battlefield Legends! Now you can recreate the Battle of Waterloo with these highly detailed 54mm reissue sets from Timpo. 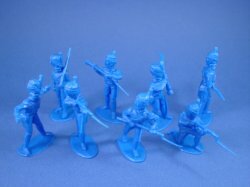 This set of French Line Infantry includes 8 figures in 8 poses. 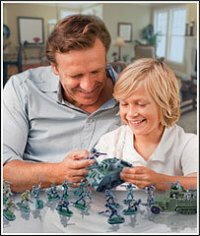 Figures are cast in blue and are ready for play, display or painting. This item is shipped to you mint in box. A terrific set of highly sought after figures!